Color Coats Application; Shading, etc. Basic color scheme: Red, Brown, Amber, or Orange? Or somewhere in between? And, how do you achieve those colors? With synthetic dyes, natural pigments, or something else? Some people induce color in their varnishes by the making or cooking processes. Some add color afterward. Thick or thin varnish: one can go too far in either direction. Too little varnish, and it has a “dry”, thin look. Too much, and it can look as though it has been dipped in marmalade, and it will deaden the sound, as well. If Antiquing is chosen, how far will you take it? Real damage, carefully repaired, “distressing” the instrument, to look as though it has survived several wars and a flood? Thick enough varnish to stop looking “dry” or “thin”…just enough to give a sense of “depth” as one looks at the grain of the wood. Gentle shading on the “antiquing,” adding darker color in the “no wear” areas, and leaving the “worn” areas a little thinner. 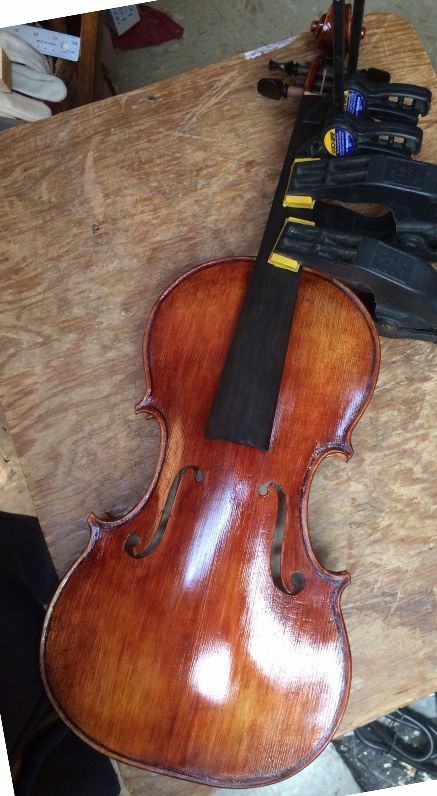 I doubt it really looks like an old violin, but it has some of the general look and charm…I hope. 🙂 I have done straight varnish a few times, and, while it looks nice, I prefer the minimal antiquing. Viola back and side with four coats of spirit varnish. 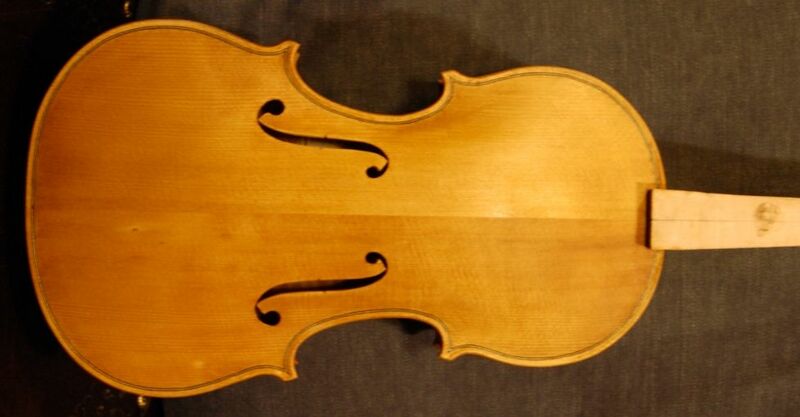 Viola front with six coats of spirit varnish. You can see that some touch-up will be needed to even out the color. Viola side with six coats of spirit varnish. Viola back with six coats of spirit varnish. Viola front with eight coats of spirit varnish. It isn’t really this red. It is still in the brown range. I don’t know why the camera affects the color appearance this way…maybe it is the lighting. Viola side with eight coats of spirit varnish. Viola back with eight coats of spirit varnish. Still some more work needed. A careful rubdown with very fine, worn abrasives precedes the final coat of varnish, so that brush-marks, irregularities of any other sort, and rough areas can be reduced as much as possible. Rubbed smooth, and ready for a final coat of yellow varnish. Side of viola, ready for final varnish coat. On this side it is easy to see the dull, freshly sanded surface. This is the final coat of yellow varnish…very thin…to achieve the look I wanted. There will still be a final rubdown and polishing, later on, but this is the last of the varnishing. Front of 14-inch viola with ninth and final coat of varnish. Side with final coat of varnish. 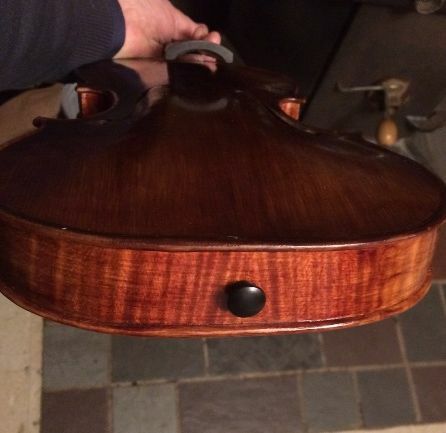 Back of 14-inch viola with ninth (final) coat of varnish. I will add the saddle and end-pin next, then re-install the fingerboard, fit the nut and tuning pegs, re-touch whatever damage is done to the varnish in the above-mentioned work, then set up the viola, with sound-post, bridge, tailpiece and strings. I’ll add the chin-rest when everything else is in its final state, and, as a very last step, seal and polish the “handle” portion of the neck. When we last posted, I had just applied the sealer coat, and it was pretty fresh, still. Back with freshly applied sealer. Dry sealer on the front plate. So here is the viola after two coats of yellow-gold varnish. This is the first two coats… Not a lot of change, initially. Varnish takes a while to build up a good film. Side view with two coats of yellow-gold varnish. 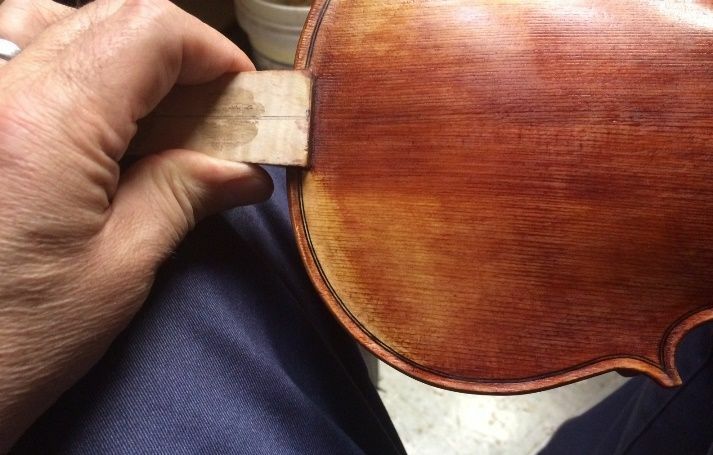 Back of viola with two coats of yellow-gold varnish. Viola front and side, with four coats of yellow-gold varnish. Viola side and back with four coats of yellow-gold varnish. The appearance changed a lot more dramatically with those coats, didn’t it? The colors are getting richer, and the finish is much more glossy. I used the flash on these last two photos, so, to stay consistent, I will try to use it (and the same background) on all the remaining photos of the varnish. At the very least, I will begin adding some red-brown varnish, to darken things up a little. I will most likely do at least a gentle shading toward “antiqued,” but I am leaning toward minimalism this time. Nothing drastic.